Here you’ll learn the difference between power and energy, and some other terminology. 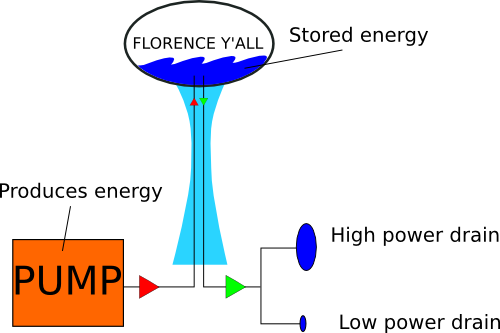 A classic analogy used to describe power and energy is based on water towers. Water in the tower is energy and the flow of water out of the tower is power. Energy can be stored, like water. It can also flow. When energy flows, it can do work like moving stuff or lighting a house. The speed at which energy flows is called power. The same amount of energy can be released at high power (which will occur quickly) or at low power (which will take more time). Energy is measured in Joules. A ton of wood might have 18 billion Joules of energy stored in it. Power is measured in Watts, which are just Joules per second. So if you burned that ton of wood in a week, your furnace would be putting out 18 GJ/week, which converts to 29.7 thousand Watts. If you burned it in a month, the furnace would be running at 6.8 thousand Watts. In the end, no matter how quickly you did it, you still used 18 GJ of energy. By the way, the amount of energy required to lift an apple 1 meter is about 1 Joule. Rather than the standard units of Joules, electric companies bill by the kilowatt-hour, as you can see by looking at your most recent utility bill. This is just another measure of energy, akin to the Joule. 1 kW-hr is the amount of energy used if it is pulled at 1000 Watts for 1 hour. If you convert hours to seconds, you’ll find that this is equivalent to 3.6 million Joules. There is a specific amount of energy in each nuclear fuel atom that can be released in a nuclear reactor. Thus, any kilogram of the same kind of Uranium has about the same amount of energy in it. In the nuclear industry, we use the term burnup to describe how much of this energy has been used up. It’s often discussed in units of Gigawatt-days (units of energy) per metric tonne (units of mass), or GWd/MT. The maximum theoretical burnup of Uranium is about 940 GWd/MT, with typical reactors reaching about 45 GWd/MT and fast reactors pushing 200GWd/MT. Nuclear power vs. nuclear energy? When discussing electricity provided by nuclear reactors, the terms "nuclear power" and "nuclear energy" are used completely interchangeably. The preferred term is nuclear energy, as nuclear power brings to mind things like the USSR, the USA, and bombs.